VA4WAN – back at it! Woo hoo! It was a cold wintery and very blustery day (for being up 40 some stories) in downtown’ish Winnipeg. A group of us, comprised of Derek VE4HAY, William VE4VR, Colin VE4CST, Robert VE4RLK, and Dan VE4DRK headed up the site to reset the link radio to our ISP Provider les.net. Now that Les is operational in his spanking new data centre (very impressive to say the least) he and Colin were able to setup one end of the RF connectivity to our repeater site. 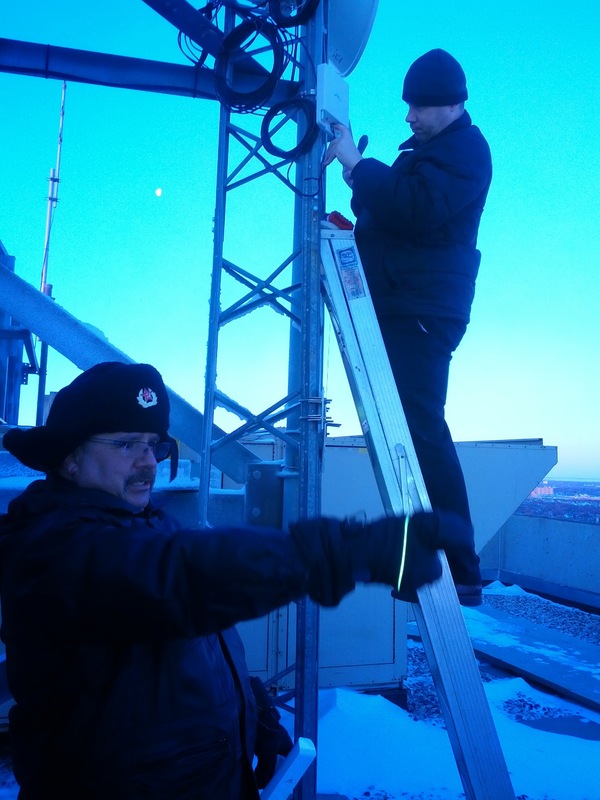 It was brutally cold – anything not covered up was freezing in minutes, so we had to have ‘warm breaks’ to get warmed back up before going back outside to the tower again. 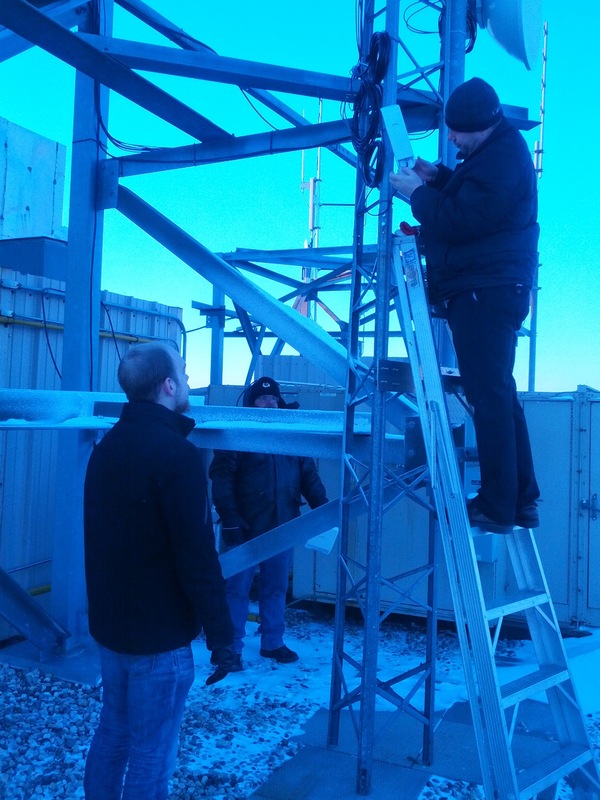 Installing the new(er) RF unit … different operating band … less interference. William, Derek and Robert. Colin in the background working hard running grounding lines and ensuring a great setup. Robert in the foreground. It’s funny how my outside pictures that far up look like they’re in the stratosphere – the hazy blue look to it. It really was that cold up there though! We were greeted with a visit by our ISP provider Les VA4LES who graciously provides our connectivity. A good site survey and more discussions on what options are available and we’re done. 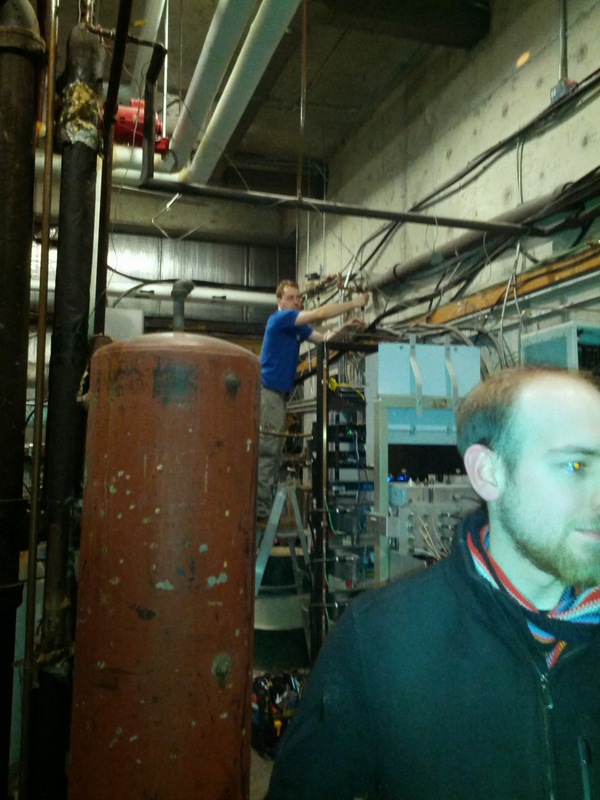 Derek and William stay behind a bit longer to configure up some of the networking setup. A little while later, Les re-routes the BGP routing for our local portion of the net 44. .. and we’re online! From my DSL connection, I’m getting under 20ms RTT to our RF link – simply awesome! Great job by all and there is more to be done to enhance the service offering to all the local ham groups and operators. Lots of RF and computer and networking to work on, but it’s all coming together now.